Initially any ski will do but as your performance needs grow you will ideally need a ski with a 21m carve radius or longer. On firm surfaces skis with short carve radius, like most modern lift access type skis, will cause an oscillation at speed and be uncomfortable for use on a kite. For really hard conditions or "boiler plate" and glass ice, the longer the better. Minimal side cut but large amounts of active edge grip are the goal on these surfaces. Lengths vary per user but can range from 198-210cm for recreational users to 215-240cm for advance riders. Many suitable skis for firm surface kite skiing are considered unsuitable for "modern" gravity based skiing. ​Unless you are looking for a modern Super-G or DH ski for kite skiing, there are plenty of skis available in the world that can be had cheaply and often free. ​Unlike a firm snow ski, the side cut and carve radius are not as important a consideration in soft snow. As opposed to actually using the metal edge of the ski to bite and provide directional control of the ski, in soft snow you plane against the snow and edge that way. ​More closely akin to what water riders experience on water than a skier on ice. Good all around under foot width for soft snow is 78mm or greater. For general soft snow 100-108mm seems ideal for most users. To achieve really good float on soft snow 130mm or more under foot floats amazingly well. Ski lengths will tend to be 174cm-189mm+ depending on use and rider size. A fairly recent feature that is found on many newer skis is tip rocker. Tip rocker is essentially an upward bend in the shovel of the ski about 15cm down from the tip. 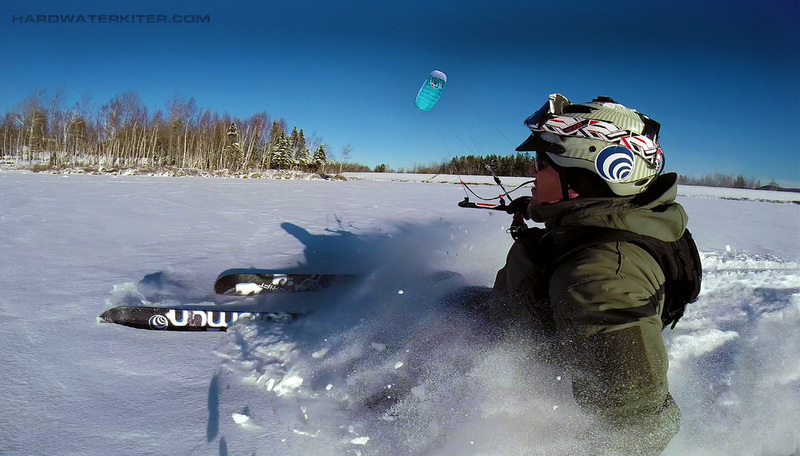 This allows the ski to float more easily in soft snow as well as assisting in initiating turns. Twin tips work fine as kite skis and they come in a variety of lengths and widths. Same parameters come into play with twin tips as non-twin tips in regard to length and width. Be aware that twin tips in deep snow require a little more power as the kick tail generates a lot of drag when skiing hard on edge. (this is visible by the rooster tail the ski kicks up) Twins are fun and it is pretty sweet to have the option to land switch. "Can I use Telemark or XC skis" Yes. Telemark and XC skis are both suitable in the right conditions. Many people use Tele equipment with great success. The quality of the equipment will have a bearing on the quality of your sessions. Old 3 pin Tele gear will work for getting you out poking around but a Plastic Tele boot and modern telemark binding will be more versatile. The advantage to a Tele set up is light weight and no need for an AT binding. A very good option for touring. XC (cross country) skis will work best on thin snow frozen to ice in light to moderate wind conditions that require minimal edging. Otherwise most semi-deep snow or uneven snow will be an issue with XC gear. Your choice in ski can be as important as your choice of kite. Forexample a ski with 127mm under foot will allow you to use a smaller kite in deep powder on a light wind day. 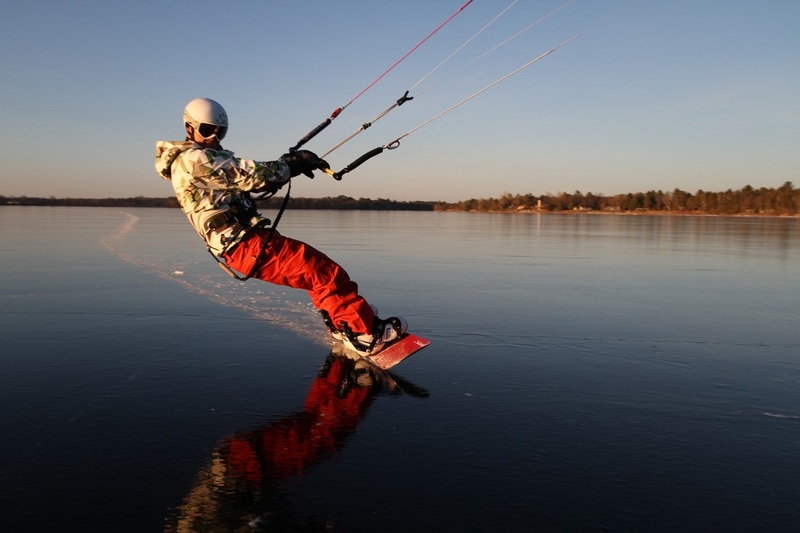 There are some variations that allow kite snowboarders a broader range of activity. For example if you are into long distance touring you need an way to get yourself back if the winds change beyond the wind range of your kite. The most commonly suggested solution is to carry snowshoes while you ride. This allows you to at least walk back to the launch. However it requires riding with snow shoes and carrying a board on your back which in high winds is a nuisance. We recommend some variation of split board. A board that literally splits down the middle and essentially turns your board into short fat skis. This allows you to put skins on and XC ski back to the launch. The board carries you! It's an AT set up, much like we describe above in the ski section. Ideal for riders looking to do long lake tours but prefer to ride a board. There are limited options for kite specific snow boards. And although in soft snow when planing is taking place more than hard edging and most snowboards will "work" a purpose built long radius board will perform better in a broad range of surface conditions. Another board related piece of hardware that works really well and with minimal cash investment can double or even triple the number of days you are able to ride you board on New England hard surfaces is an add on called the "Switchblade" It is simply a bolt on blade, much like a hockey skate blade, that you bolt onto your board. You wouldn't put this on your full time board but on a board that you have specifically for use on hard surface days. The Switchblade will give a kite snowboarder the ability to edge so well on glass ice that even those of us on skis get a little jealous. Yet you can still ride on ice with some snow on it. The Switchblade is pretty versatile. They are made by Kite Snow Boarder, Todd Hanson out in Minnesota and can be purchased for around $220 at http://www.mnkiteboy.com/. Any Kite Snowboarder in New England is missing out without one of these in their quiver. Whether you are a skier or boarder, having your equipment tuned and waxed is essentially to getting the most out of your sessions. Many snow kiters will often use AT (Alpine Touring) boots as they are comfortable, light weight and have rubber hiking soles with a tread which help when having to hike or walk especially on the slick ice while setting up or breaking down your kite. 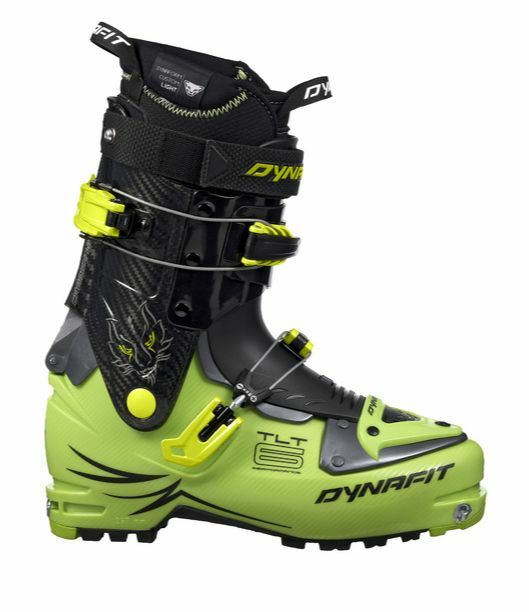 These boots may or may not have toe and heels that are compatible with special AT binding systems like Dynafit systems but even those usually have a DIN toe and heel that are compatible with most AT and Alpine Binding systems. Some will have multiple replacement toe and heel plates to adapt to whatever system you have. Always check with a qualified ski shop for boot/binding compatibility. Historically AT boots lacked the stiffness of Alpine Boots. Now, there are high stiffness options that allow the best of both worlds. Alpine Boots come in an array of stiffness and types. High performance boots (often identifiable by one or two rivets in the back of the cuff) tend to be stiff with a flex index of 110- 150. These boots are targeted towards high performance and work well for high speed kiting on hard surfaces. This is needed to drive larger, faster skis or to get a sufficient edge bite on glass surfaces. Comfort is often a concern with this type of boot but with a proper fit, these boots can be surprisingly comfortable but you have to be a strong skier to really drive them and reap the benefits they offer. Your ski boot is the most important piece of your ski equipment. It is the "steering wheel" you use to drive your skis and having the proper boot and the proper fit are extremely important for optimum performance. There are endless varieties of ski boots on the market but regardless of the quality or type, whatever you choose, if it doesn't fit correctly and have the correct stiffness to drive the ski, you won't get all the performance available from your skis OR KITE. Yes, your kite. Boot flex directly influences how well your ski edge bites. Your ability to edge the ski directly effects the amount of power and upwind ability of your kite. You can have the best skis in the world and it means nothing if you are wearing a boot that can't drive them properly. 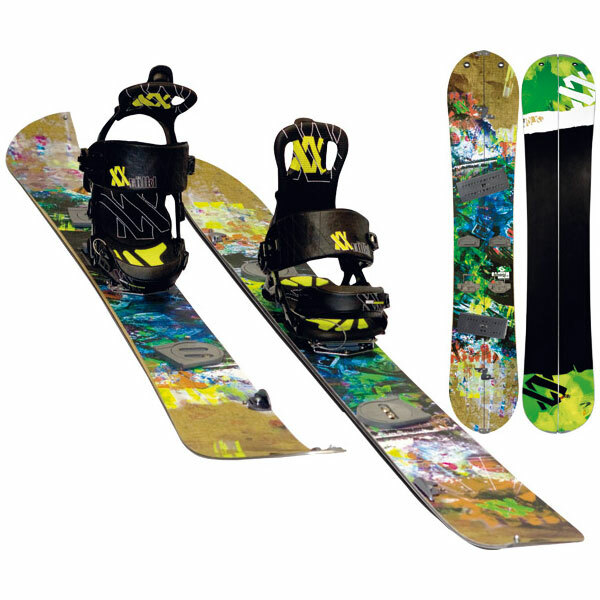 Alpine Bindings are what you would find commonly on any lift area ski set up. The are generally heavier and less expensive than an AT system and on many modern skis they are actually an integrated system with the ski they are mounted on. Meaning you may not have options for other bindings on some ski systems. Some bindings, like the mid 90's Marker M-twincam series bindings have a tendency to pre-release when put into situations where the ski gets over cambered (as in a hard aggressive powered turn or stop) and then de-cambers. The forward pressure of those bindings is not fast enough to compensate and the ski will simply fall off. This is not an issue with non-twincam Markers. The only instance where an average alpine binding is not a suitable choice is when doing long distance tours where the risk of being stranded by the wind is present. In those instances an Alpine Touring (AT) binding is a better choice. These bindings, when paired with climbing skins, allow the rider to pack up his/her kite, disengage the heel of the binding and cross country ski back to the launch area. There are various makes and models of AT binding. HARDWATER KITING recommends the Marker Duke (as seen here), Salomon Guardian or Fritsche Freeride. The first two are essentially Alpine bindings on an AT platform also referred to as "Side Country" as they are often used at lift access areas but taken of trail to the woods on the ski area property. This means they are torsionally stiff enough for the most aggressive skier, are available with high DIN settings stiff and are build with durability over lightweight as a goal. As true AT bindings they are considered heavy and hard to actuate from ski to tour modes but for kiting, this is not a problem and they are ideal. The Fritsche is more a true AT binding than the other suggestions and a nice balance in design. Light, easy to use and fairly high performance for an AT binding. Not as durable and if you are doing really aggressive edging and/or freestyle maneuvers we have seen they tend to be considerably less durable than the other types we've discussed. If you are using an AT system you will also need to use a set of climbing skins. These are applied to the base of your skis while in tour mode to give you traction on the snow while allowing some level of gliding ability. An alternative to using a purpose built AT binding system would be the Alpine Trekker. 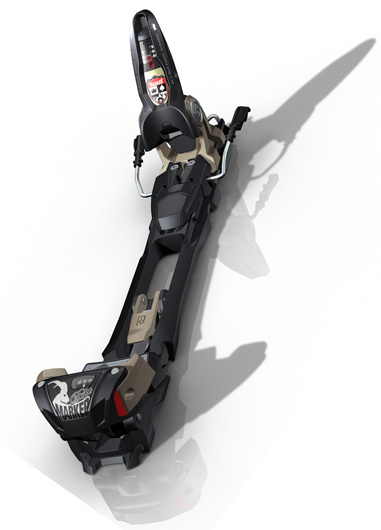 Alpine Trekkers allow you to convert any alpine binding system for use in alpine touring. Or in our case, skinning back to the car when the wind dies. The downside is you have to carry them in a pack when not in use. They work with all DIN standard alpine and AT boots. The up side is you can use them with all your skis with minimal cost. A good option for riders on hard surfaces who want to ride their race skis for long distances. Skins come in a many lengths and widths and can even be custom cut to a specific ski. There are various manufactures of climbing skins, we use Black Diamond. They come in various lengths and side cuts or can be custom cut to your ski. Often a half skin, which goes for the tip to mid way down the ski, is enough for our purposes. They tend to pack smaller (fit in your pocket), cost less and are lighter. For our purposes on the lakes we have a lot more flexibility in what skins we use. Full width or full length are not critical for crossing a flat surface as it is for climbing so you can get away with narrow, old school skins or half length skins. This saves money and also allows the use of one set of skins for all your ski types.